Ideal Tax Solution, LLC has learned the IRS is scrutinizing returns prepared with the assistance of software company products between February 14 and February 22.The problem is related to Education Credits during that time period. Glitches in the tax filing process are unfortunately not uncommon. Ideal Tax Solution, LLC is notifying all of its clients and concerned taxpayers of a review currently underway by the IRS, which is targeting Education Credits on Form 8863 filed with tax returns during the week of February 14 through February 22. The review is targeting a limited number of software company products. The IRS is working closely with the companies involved to assist in the review and processing of the problem returns. A typical review process for this kind of scenario can take up to 8 weeks. Ideal Tax Solution is reaching out to affected taxpayers in an effort to help them retrieve their refunds in a timely manner. The IRS says it is taking special steps to resolve the situation, which will allow taxpayers to more quickly receive their refunds. Ideal Tax Solution has learned that because of the additional focus being placed on the software issue, the refund timeframe should fall within a 4-6 week window from the date of this announcement. The number of tax returns affected by the software issue numbers about 10 percent of the total returns claiming the credit. The status of an affected taxpayer’s review can be found by visiting “Where’s My Refund?” on IRS.gov, or by contacting Ideal Tax Solution for help in determining the status. If a taxpayer has not received a refund date after filing in the affected period, the IRS recommends contacting their software provider to ascertain whether or not they might be in the affected group. 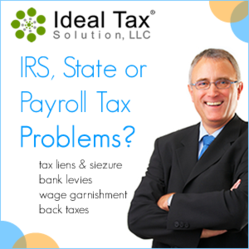 Ideal Tax Solution can quickly assist in determining a taxpayer’s status and expected refund date.